Booked my ticket. Flying out to visit. I am on of the teachers that lets students use their phone on EVERYTHING!! Our school is BYOD (bring your own device), and we even offer free wifi to students if their device is “registered”. When students take test and quizzes I just remind them HOW they are allowed to use their calculator and that if they don’t use their phones the right way they will lose that privilege. I have a lot of success with this idea of using cell phones, and I am not sure how I would teach anymore without them. I have stop wasting the school’s money on calculators, and now students have tools like Desmos and scientific calculators when ever they need them. Society has changes, school and teacher also need to change accordingly. Phone calculator does not require Internet access, bandwidth so not be a issue. I usually think that an assessment that restricts resources simply means the skill or knowledge being assessed is too low level. My physics unit tests are like 3 act tasks and are fairly open ended; however modern phones are just too good at communicating video/audio and pictures. I let students listen to music, they have to keep their phones down. The internet is still open . . . Thank goodness they haven’t tried to message over that . . .
I’ve been thinking a bit about this today, Jim. We wouldn’t say that someone running a mile around town is performing low level exercise simply because cars exist. I don’t think I can say solving equations is a waste of time simply because Wolfram Alpha exists. I’m thinking it’s more like a specific skill and not the whole thing. Kinda like how grant wiggins would compare teaching to sports. In sports, skills are taught in isolation and then brought together to play a game. Same so in school. I have no problem limiting technology for specific skills (I called it low level – which might be a misnomer!) . . . But to limit resources on a larger test of abilities. . . That would be like telling baseball players they can only bunt . . . I also believe since you are a physics teachers your main objective is physics, which so happens to include math. So you allow them to use a device (calculator) to answer the part of the question you are not concerned about. James Cibulka: “Kinda like how grant wiggins would compare teaching to sports. I let the students demonstrate *any* skills they’ve learned in the game, but they need to show me *their* skills, not their friends’ (or mine by asking me if the question is correct). I think the problem I have the technology is that it is so much slower than knowing certain things. And if you don’t know certain processes you will never actually use them. a) what does “specific heat” mean? – it’s very inefficient to look it up every time, and it should be more of an understanding of the principle and looking at objects and thinking, oh it can have a mass, a charge, a specific heat…. That said, in labs and projects they can demonstrate research and team work skills that are important, also. Great post Dan. I also run into the test security problem. However, isn’t the real problem that tests are written in a manner that makes “calculating” the dependent variable, not logic or analysis. Also, test prep should eventually be a invalid point with ACT moving to web based systems. I would imagine all would very shortly. This year I have begun to let students use their cell phones in class to do calculations. It is important for students to understand how to use this built in feature of their phone, because that is what they will use more often post high school. So, this year I showed how to do certain calculations on the TI-84 and on the cell phone. For example, sin of 35 degrees. Are you in degree mode? Also, this year I had someone download a graphing calculator app that behaves like a TI83/84 on his phone. He uses his phone in class and I loan him an actual calculator for testing. I think the app was $4.99. And it really does work like the TI83/84. I would be ok with students using their cell phones as calculators more often if they were not able to communicate with them during the test. There’s got to be a “Teacher’s Pet” app that would allow me to disable communications during testing. iPhones have a app built in called “guided access” that let’s you lock the phone on a certain app. This dude is making some sense. Build a feature into the calculator that takes over other functions of the phone. Or tracks them and reports on them. Like those teen tracking apps. And then give all the relevant information to teachers. Yup. Would we allow a student to enter our classroom during a test and hand a manila folder to a student? Nope. I like your idea, but privacy issues probably trump that feature. Real question: How do we (educators with direct access to students) notify them (publishers, policy-makers, and test-writers) about the changes in math education? The comment “You’ll need to know [calculator] skills for the test.” seems to only further the idea that math is an abstract silo with skills divorced from the rest of the world. Related: thanks to Desmos for making in-roads with CAASPP and SBAC; that’s a meaningful step. I love the Desmos app and any free calculator app, really. Before I knew about Desmos, I had kids download a free graphing calculator app. But, there are things that the TI is really good for as the the level of math increases. I teach Statistics and Algebra 2. The boxplots, chi-square and normal distribution functions are essential. I am hoping, when I get these seniors, that they have some familiarity with the ti-84 before they get into that class. If they don’t, they may feel a bit behind. Once they get used to learning how the menu’s work, they can hunt around and find things pretty quickly. Once the students learn to use the calculator, it’s a good tool. Is it clunky or intuitive? Yes, it’s clunky and no, it’s not intuitive until you learn more about the menus and many many features and modes. Is it offline? Yes. Does it let students share answers? Only if they are sharing the calculator. It’s not the best option for straight up learning/playing and exploring graphs – Desmos wins that contest, hands down. Excel would be better for Statistical topics – but that requires even more expensive tools. The reality of the academic world regarding test security and cheating really seems to be requiring that kids get some level of facility with graphing and scientific calculators. Once you’re out of school, it seems there’s very little need for them. I am lucky enough to work in a school that is 1-to-1 and the district invests in an assessment system (Illuminate Ed) that allows a software calculator to be embedded. In addition, being in the middle school means SAT/PSAT are quite far away, so we aren’t pressured to teach students how to use a hardware graphing calculator (yet). Test security isn’t exactly a reason because tests are run on a secure browser (sort of like a kiosk mode.) So yes, we use software calculator on some tests too. I am never a fan of a hardware graphing calculator, but on the other hand, I have found a cheap $10 TI-30 scientific calculator being a life saver. The students (and I) don’t have to alt-tab or use up the valuable screen real-estate for a calculator. It is a matter of convenience. Embrace phones and interconnectedness to create collaborative (perhaps creative) assessments. In my Year 11 class there would certainly be collaborative assessments if I allowed them to use phones. They’d all pay James to give them the answers. I’ll double their fee and tell James to feed them wrong answers. Problem solved. Nice try Dan, but they like James and James likes them. He wouldn’t take your money. And even knowing that he fed them answers would be no help because they know how to send messages that leave no trace. I sometimes wonder if those that advocate using phones in tests have the slightest idea of just how fast, well and pretty much invisibly modern children can spread information. Students seem to be incapable of monotasking if they have access to their phones. They are so addicted to technology and swiping between apps that they can’t use their phones just for mathematically useful purposes in class. Letting them use their phones means soon they are snap-chatting when my back is turned, or texting each other, or googling something instead of thinking, or the most common, fiddling with their Spotify instead of fully engaging in the math at hand. We have 1 to 1 laptops at our school, and I used desmos extensively. But I also have them close their computers and work in “meat-space” fairly regularly, mainly because it’s such a cognitive drain on me to try to make sure they aren’t playing a game or texting or surfing or doing their English paper or their history homework instead of joining the math conversation. It is SOOO seductive, this technology. I’m afraid math can’t compete unless they have some time where it’s the only game in town, time when I can hook them into the lesson. Many good points to ponder. The word killer is ambiguous—‘killer feature of hardware calculators’. Killer=great? or killer=deadly? As to cost, I thought smart phones with data plans were more than 2*$130. I still do not own a cell phone ( I have an iPad, though). She allows the device for paper tests, but monitors with AppleClass and device flat on desk. Granted a phone could snap a pic in less than 3 seconds. I use Nspire handheld and sometimes allow document use and sometimes press2test. We might go CPM next year and with the eBook, there is a quick click to Desmos. I will give it a try, but Nspire offers so much more. So I will probably use both Desmos and Nspire App. Find a way to have Desmos lock down screen capture and camera, web, messaging. SmarterBalanced allows Desmos. Does the secure browser prevent that outside communication? SAT and byod is another topic, eh? I will continue to ponder the liability/feature inflection point. Thanks. I think that “killer feature” refers to the aspect that “kills off” all competing ideas/products. In this case, it seems to fit because hardware calculators have effectively killed off software calculators despite the cost/features comparison that should favour software calculators. With graph rendering, I have had significant issues with the lag for TI-84 calculators graphic numerical derivative functions so processor speed is certainly an issue for some purposes. Likewise the low-res, monochrome screen makes it difficult to interpret and compare multiple graphs. That said, the biggest issue with graphics calculators is their price. For what they offer, they should be about $20-$30 and would be good value at that price due to their robustness and battery life for in-class use. The current high price appears to be sustained only by the fact that they are effectively required for students sitting exams. If someone agrees that we should empower our youth with knowledge and skill in the means of production… it begs the question why computers aren’t available during exams. Leaders turn excuses into improvements. Security? -> Need for better tasks/questions/items. Distraction? -> Need for discipline. Policy? -> Need for policy change. Test Prep? -> Need for better high stakes tests. Access? -> Need for improved infrastructure. Evan, thanks for the comment. I need to think more about your remark about leaders. Surely some excuses are valid. In particular, I don’t think we should abandon all simpler problems simply because new technology makes them easy to copy or eliminates the need to solve them anymore than cars obviate the need to run for exercise. We don’t set algebra tests because we need those algebra problems solved. We set them because we need the students to learn a new way of thinking, which enables them to understand and manipulate abstract concepts. That means that they have to be able to think a certain way. Having a machine solve the problems does not enable them to learn the required thinking skills. Would you advocate that we no longer have languages taught in schools, because Google Translate can do the job instead? At a senior secondary level (at least in Australia and USA), we are constrained by external assessment with externally-imposed restrictions such as a list of approved (hardware) calculators. For this reason, I encourage my students at earlier stages to use these calculators in order to become fluent with their use. That said, I totally agree that they are overpriced for what they offer, especially in a classroom where every student has a laptop. I’m not saying I agree with all of this, Chris. (See my comments to Jim & Evan.) But this is really thoughtfully articulated. I’m adding it to the post. (In particular I appreciate you describing a re-balancing (rather than a complete elimination) of concerns. I’m not arguing at all that low-level rote skills aren’t important. Without these skills, it’s really hard to do anything significant. My concern is that we tend to write assessments that focus on the rote skills, which encourages many students (and teachers) to sidestep the conceptual understanding and drill the skills. Unfortunately, this “works” in the sense that students can do well in exam-based assessment without much understanding as long as they have memorised enough facts and procedures. An interesting twist that has just dropped into the Australian system is the introduction of proof by induction in the final year of high school. So far there is no list of required proofs (which could be memorised) so students need to use strategy and understanding to prove previously-unseen hypotheses. In order to do this, they need to have all the rote skills at their fingertips and sufficient experience to know when these skills would be useful. The ability to execute the skills is necessary, but not sufficient, to make progress on these problems. Electronic aids (of any type) are simply a timesaver for students who understand and almost useless to those who don’t understand. The only problem I can see with internet-connected devices during exams is the ability for (rich) students to have a capable person outside the exam room doing the exam and passing the results back via the internet connection. I don’t know a good way of dealing with this. Hey I just wanted to respond a bit to underscore your comment about how math is taught and the rote skills. I am an electrical engineer and I approach math teaching completely different than a traditional math teacher and even after 17 years of doing this I am still amazed at how much it improves a teaching efficiency to simply teach the students how to think and how to solve problems. I tell them problem solving is not merely solving problems that they have previously seen. Problem solving is learning how to solve problems that they do not know how to solve. Once I teach them how to solve problems then they get much better at math on the ACT and SAT tests. It is amazing how few math concepts they really need to know – but they need to know how to use those very well. I work with a lot of straight A math students who only make a 20-24 on the math part of the ACT. I know these students have the fundamentals covered and then all I have to do is teach them how to solve problems and their scores steadily improve into the 30s. It may take me 3 or 4 one hour sessions to get them to that point. No matter who the kid is – and I work with around 400 different students in a typical year – nothing seems to excite them as much as getting to where they feel comfortable working math problems. I tell the students that math is exercise for the brain. Of course there will not be “real world” needs in the future for them to factor or figure out how high the tree is but getting their brain to develop the pathways for basic problem solving is something they will use every day for the rest of their lives. Simply understanding this really changes their perspective and attitude towards math. Chester Draws nails it! And for all those that think they are tech savvy by using the latest technology out there, please let me perform your next major surgery. I sure could use the money and hey, I’m confident I could find a YouTube video to guide me through it. I know Apple and the others control certain parts of the devices and may not allow you to actually disable them with another app but I can see a marketplace for an app that could be partnered with a PC/Mac app that connects to all the devices and allows them to access the calculator function but if they leave the app screen at all the teachers control unit would be warned. Then the teacher could take whatever action they want. There would be a side benefit for that app in other situations. It would require the cell phone owner to activate the app before it would connect to the teacher control unit and the student would be in charge of deactivating it or the teacher could disconnect all phones from the control unit when a test is over. Structurally that should be a big selling app. Thanks for your thoughts, George. It seems like you and Ryan are in some kind of accord above. I’ll think more about this. I work in a BYOD school. What I have learned is that the best way to disengage students from electronic devices is to promote learning that involves student sharing of discussion, planning, thinking, and solving problems. When the students are put ‘centre stage’, the devices start becoming less interesting… …and those who enjoy using the power of the internet to ‘google’ answers or use wolfram alpha are challenged to ‘prove’ how they know, or to dig deeper into the ‘googled’ answer. I also find that I am more drawn to teaching that involves creative and critical thinking ‘a la 3-acts math’ or Fermi thinking. I suppose in terms of assessment, test security would be my issue for not allowing technology in tests- which means tests need to evolve to more creative input from students – for example, ‘design a business model and use matrices to explore profit or growth…..or ‘demonstrate your knowledge of shape and measurement by designing a small outdoor courtyard – .use elements of perimeter, area, volume and capacity in your design. Whilst students may be able to access the internet, a time restriction element and non-plagiarism requirement might ensure that every design will be unique. Thanks for your comments here, Jennifer. I think they articulate very clearly a model of instruction where technology is additive. I’ve featured your comment in the main post. I teach mathematics to college freshman, most of whom are not mathematics majors. I allow my students to use the calculators on their cellphones during class and even encourage them to use Desmos or other free graphing calculator apps in lieu of buying a graphing calculator. I agree with the many who have described how we can leverage this technology in our classrooms. I’m not a very fast mental calculator and hate it when my students get distracted from problem solving because they are spending so much mental energy calculating. When they have to mentally “move away” from solving a problem to multiply 3537 by 4829 by hand using the standard algorithm instead of using their calculator to quickly determine the product, they often lose their train of problem-solving thought. I still haven’t figured out how I can allow them to use cellphone calculators on tests/quizzes. However, I think part of the answer is in the relationships I build with them. While I do still have to periodically ask students to stop texting/snap chatting/facebooking during class, I find that most of the time students are engaged with me and their classmates because I constantly work to build community in my classes. It’s exhausting work but totally worth it. At this point in the semester most of my students feel accountable to me and each other. This seems to help minimize their desire to use their phones to engage with people outside of our class during class time. I wonder if this accountability would be strong enough to keep them from using their phones to cheat on tests/quizzes. I’m pretty loose about phones because a) every “test” is just an open note assignment I happen to collect b) I’ve started making it more about writing/explanation anyway and c) any kid looking to Google for an answer is not a kid who will be finding their way to infinite As. I’ve watched kids Google for math answers. It never works out. Primarily because they aren’t well versed enough in the topic to know *what* to Google in the first place. I see it all the time. They will take the *exact* question and type in a search box, often with “how do you solve [question]” and wind up on a goose chase of overkill Wikipedia articles, assignments posted from a college, or something else completed unrelated. Every so often they’ll find a Khan video that’s relevant. How successful is this method of cheating if it requires spending 5 minutes watching a Khan video, and then maybe getting lucky and gaining clairvoyance on the particular problem in front of them? This magic website with all the answers to *your* test questions is a fantasy (unless you’re using a packet posted publicly). Any student wandering down that path is going to find something unhelpful. Should they find something they think works, it’s usually pretty obvious in their answer that they sourced the internet. No different than the kids who will randomly start pressing calculator buttons on questions where a calculator is of no use. Most students lack the experience with the material to make this method useful for them. So I don’t worry about it. What I do worry about it is why does a kid feel they need to resort to a random internet search? How I can improve their ability to create a resource that will have what their looking for, through explorations, activities, class notes, or what have you? If I am interesting in testing rote mechanics, what have I done to support their ability to succeed there? If they feel the internet is their only option, what do I need to do better? Can it be used quickly enough to complete an assignment by a kid who isn’t what their doing? I’m not sure. That’s the point I’m getting at. A student insufficiently prepared for the material is insufficiently prepared to use what’s our there to finish a test in a meaningful way. The internet search is not so much of a concern. The concern is that they transmit the exact question to other periods, maybe even with their answer. The receivers have an unfair advantage and maybe do no thinking and merely copy down what another student wrote. If it is verbatim, then there is a chance to discuss the issue with them and/or consequences. These conferences and discipline consume an enormous amount of time. If a teacher is okay with posting the test on the door and then allowing students to bring in notes to complete the test, then I think that practice needs to be questioned. Is it an authentic representation of the student’s ability? Despite allowing open notes, I use three versions, dispersed at random, with no easy way to identify which version is which. I know that kind of cross-period transmission is a problem, but if it’s been happening to me it’s an issue on less than <1% of papers. In courses where I don't do this, the "test" as it were is just a piece of paper kids complete and use as a center of discussion. There's a larger issue of holding tests in such high regard that we feel the need for all this security, but that's another debate. I just wanted to mention a cautionary tale regarding the idea of hack-proof devices. I want to ask the big question: What is the purpose of our tests? What are we trying to measure and what is the purpose of measuring it? Once educators honestly acknowledge the answers to these questions, the issues of test security and accessing online “cheating-tools” seem irrelevant. Teachers should ask themselves: Is the assessments designed to simply measure students’ ability to replicate what they were told or are we trying to measure their thinking and ability to apply the math. I am always looking for problems that truly USE the math and cannot wait to get away from some of the restrictive assessments that we are required to give students. I want students to use the best tool available to them and to use the best resources they can get their hands on! The core of my view on assessments, well said. Drawing a hard line on test security makes you more vulnerable to these problems I think. I can completely identify with Tamara’s comment above. Recent example – when my 8th graders learned about finding the Mean Absolute Deviation of a set of data, I didn’t want to teach an algorithm, or a way to program/use a graphing calculator (handheld or otherwise) to find this “mysterious number”. I searched the web for ideas to help students develop an understanding of variability, and truly experience the MAD to the point that they “discovered” and needed it. I found great ideas from MTBoS-ers and created a Desmos Activity to help them develop the concept. Fast-forward to right now. Our state test is this week. According to our standards, students will most likely be asked to find the MAD of a short set of data, probably on one problem. For the record, my students didn’t wait for me to share that the MAD can be found super-easily on Desmos and not-as-easily-but-still-feasibly on a handheld graphing calculator. They’d already “Googled” and/or taught themselves. On the high-stakes test, I’d bet money that students will simply be asked if they can apply a MAD algorithm to get an answer. I wonder… do students actually REGRESS in their understanding of MAD or (fill in the blank with another topic), because too little is being asked of them on the big ol’ state test? That is, I propose that our calculator use policy be varied–sometimes insist that it be disallowed, and other times insist that it be required, and yet other times allow it to be optional. This happens on the AP Calc test, for example. Notice that the calculator section of the AP test says “Calculator Required.” I think this is an important distinction. We should give students problems that are so messy that they really must reach for technology (notice that the SAT and ACT do not make this demand–these are really ‘calculator optional’ tests). And we should also give students problems where we disallow a calculator, so that we can see if we’ve met standards like the one above. I do realize there’s a way to test students on the “by hand in simple cases” part of the standard while they still have calculator access. The classic example would be giving them a graph and asking them to come up with the equation. Students can still guess and check, but they at least have to know *something* about how to generate the graph shown. While this is a good work-around, I still think it’s less than ideal. We should be allowed to ask our students to graph y=3cos(2x)-1 *without* a calculator. We should be allowed to ask our students to graph y=3.8xcos(2.3x)-250 *with* a calculator (probably on the way to a higher demand). Can we allow for some middle ground on this debate and call for varied instruction? Interesting comments. How many of the respondents were High School teachers? As most seem to be discussing graphing and algebraic manipulation. What was the response from middle school or elementary? Was there any response? I’m surprised no one has mentioned the tactile experience that a non-phone calculator provides. It’s possible I’m behind the times on this – in fact I’m sure I am, but whether it’s typing on a keyboard (over a keypad), reading a physical book (over a kindle) or the tick-tack of a physical calculator (over a phone app) I find it much more “fluid” to work on a physical instrument over a touchscreen. 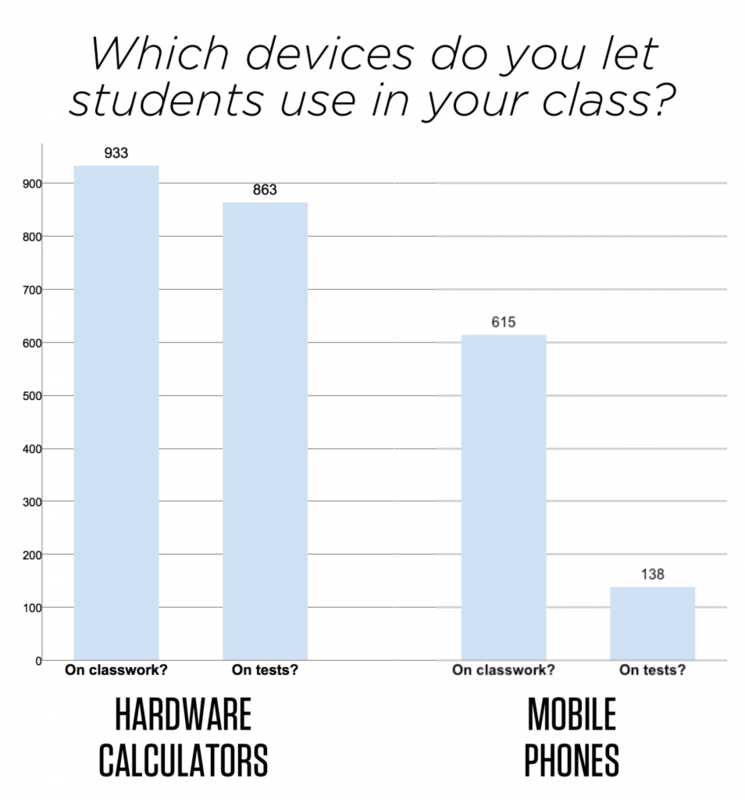 Does it justify the price of a TI-83 or the disallowance of phones? Certainly not. But it might explain some of the reticence. Relatedly, see Cathy’s post from a little while back re: student preference. I am from the University of Illinois and I am preparing to begin my student teaching semester. One of the graphics in the article showed that most teachers that you interview are against phones in the classrooms because of test security. In what ways can you combat this if a student tells you they need their phone for safety reasons? For example, a student comes up to you and says my parents want me to have my phone on me at all time. 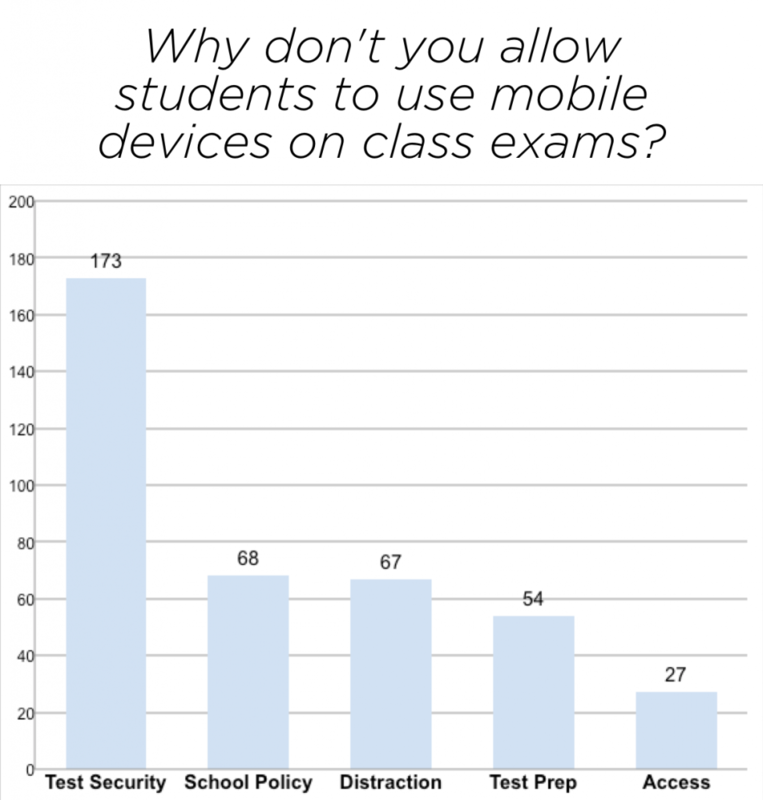 How would you make a consistent Cell Phone policy to all students that could possibly eliminate cheating on tests? Hi Mike, it seems to me that teachers can allow students to have a phone in their pocket (for safety reasons) and disallow them on tests (for security reasons). “Just keep it in your pocket on tests,” seems like it would fit both needs.